Tourists have gold necklaces ripped off their necks. Women’s fingers have been cut off for wedding rings. Cameras, laptops and iPhones make you an instant target. Leave everything at home that you can’t bear to lose. Don’t go on the streets after dark or you’re asking to be mugged. If mugged, hand over whatever they want without a struggle. We decided to leave all our jewelry at home. We made copies of our passports, visas and drivers licenses and put the copies in our suitcases and wallets. We hid our cash among our belongings and even made “fake” wallets for our backpacks. We put in a few fake photos, an expired library card and a few dollars. We could afford to lose these if we were mugged. Landing in Rio de Janeiro mid morning, we gathered our backpacks and collected our suitcases at baggage claim. It was time to ward off all the thieves and muggers whom we’d been warned. With some Brazilian reais (we’d made a currency exchange at JFK before leaving for Rio,) passports and credit cards hidden in our waist belts, we headed out to the street to find a cab. We’d been warned that foreigners, especially Americans, may not always get a fair rate when hiring a Brazilian cab. Neither of us speak Portuguese, so that instantly made us feel a little more vulnerable. However, we’d planned for this moment and knew we were looking for a Radio cab. They charge a fixed rate and are supposedly safe. We found a Radio cab and jumped into the cab’s backseat. We showed our cab driver a piece of paper with our Rio Airbnb address written on it. 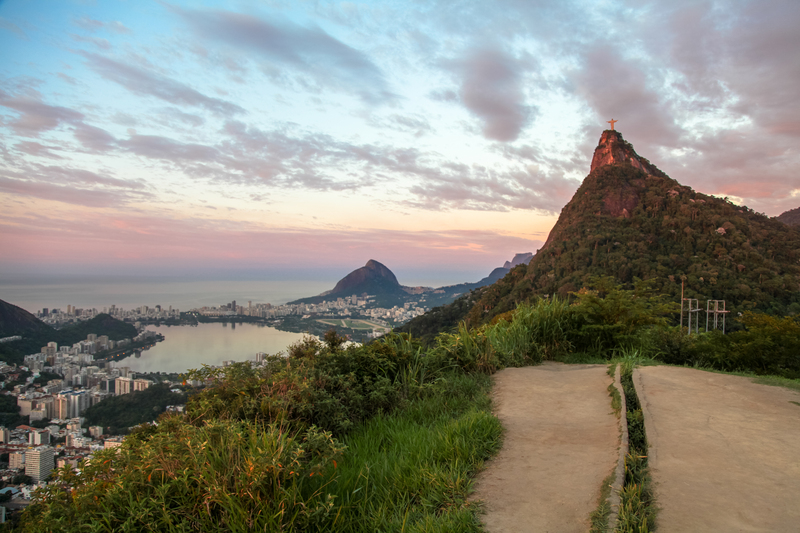 He nodded, and we were off – speeding through the busy streets of Rio de Janeiro. Our cab driver pointed toward a hillside and began to speak in broken English…”after tunnel, you see Christ Redeemer” and into a dark tunnel our cab traveled. Sure enough, once out the other side, I looked behind us, and there it was, the infamous Christ Redeemer statue, up on the hilltop, overlooking Rio. The statue is majestic and represents the Catholic faith that is dominant in this Brazilian city. Safety. 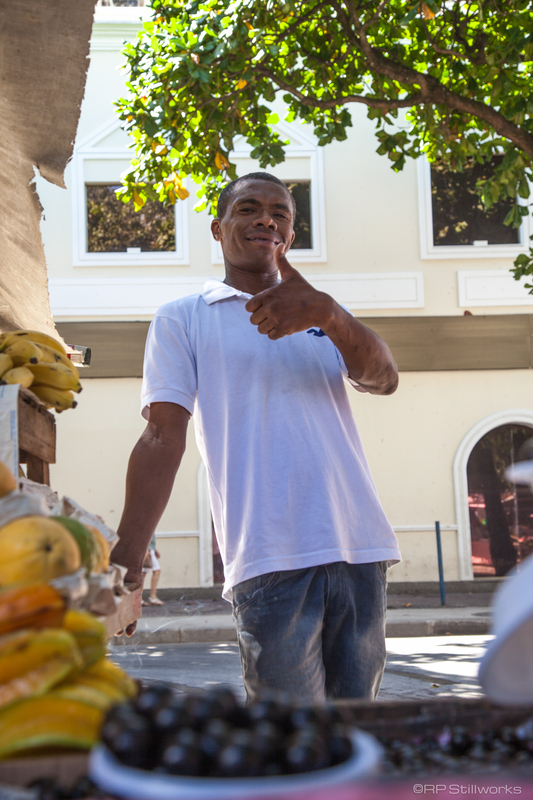 I whispered to LCP that our cab driver looked like a friend from home – a Brazilian version. We smiled when agreeing on the similarities. After about a 20 minute drive, we pulled up in front of our apartment building. Our driver warned, “no park here,” so he pulled over and unloaded our bags on the opposite side of the street. Our twenty-something, robust driver handled all our luggage and made sure that traffic was clear before we crossed the street – all the while rolling our suitcases for us. This was the perfect first encounter with the Brazilian people. A caring man who had our safety as a priority. We entered the apartment building and waited in the foyer, in the company of the building’s door security officer, for our Airbnb’s owner to arrive. Pedro showed up about 5 minutes later. After a warm welcome, a kiss on each cheek, we followed Pedro to Apartment #2. A door lock and two deadbolts later, we were in our modern one room apartment where we’d live for the next 6 days. Pedro showed us around the apartment, gave us instructions on the safe, told us to turn off the A/C when leaving the apartment or when showering (the transformer is too weak to handle both the shower and A/C at once) and handed us the keys. Pedro suggested places to go for dinner and for a morning juice. He warned us to not keep our cameras or phones out in the open when we are on the streets. We felt safe with him. He is a photographer, too, so he showed us some of his work that he has on his phone. We were immediate friends. Our fear of the city, now shadowed by the people who we’d been introduced, lessened. Like any other foreign country, we were outsiders and needed to respect the culture that we were visiting. Yes, we had to be smart about how we traveled, but we didn’t have to be victims. Kindness and respect are universal languages, as is a thumb’s up.